"P-39" redirects here. For other uses, see P-39 (disambiguation). The Bell P-39 Airacobra was one of the principal American fighter aircraft in service when the United States entered World War II. The P-39 was used by the Soviet Air Force, and enabled individual Soviet pilots to collect the highest number of kills attributed to any U.S. fighter type flown by any pilot in any conflict. [N 2] Other major users of the type included the Free French, the Royal Air Force, the United States Army Air Forces, and the Italian Co-Belligerent Air Force. Designed by Bell Aircraft, it had an innovative layout, with the engine installed in the center fuselage, behind the pilot, and driving a tractor propeller via a long shaft. It was also the first fighter fitted with a tricycle undercarriage. Although its mid-engine placement was innovative, the P-39 design was handicapped by the absence of an efficient turbo-supercharger, preventing it from performing high-altitude work. For this reason it was rejected by the RAF for use over western Europe but adopted by the USSR where most air combat took place at medium and lower altitudes. Together with the derivative P-63 Kingcobra, the P-39 was one of the most successful fixed-wing aircraft manufactured by Bell. In February 1937, Lieutenant Benjamin S. Kelsey, Project Officer for Fighters at the United States Army Air Corps (USAAC), and Captain Gordon P. Saville, fighter tactics instructor at the Air Corps Tactical School, issued a specification for a new fighter via Circular Proposal X-609. It was a request for a single-engine high-altitude "interceptor" having "the tactical mission of interception and attack of hostile aircraft at high altitude". Despite being called an interceptor, the proposed aircraft's role was simply an extension of the traditional pursuit (fighter) role, using a heavier and more powerful aircraft at higher altitude. Specifications called for at least 1,000 lb of heavy armament including a cannon, a liquid-cooled Allison engine with a General Electric turbo-supercharger, tricycle landing gear, a level airspeed of at least 360 mph (580 km/h) at altitude, and a climb to 20,000 ft (6,100 m) within 6 minutes. This was the most demanding set of fighter specifications USAAC had presented to that date. [N 3] Although Bell's limited fighter design work had previously resulted in the unusual Bell YFM-1 Airacuda, the Model 12 proposal adopted an equally original configuration with an Allison V-12 engine mounted in the middle of the fuselage, just behind the cockpit, and a propeller driven by a shaft passing beneath the pilot's feet under the cockpit floor. Bell XP-39 showing the position of the supercharger air intake. The main purpose of this configuration was to free up space for the heavy main armament, a 37 mm (1.46 in) Oldsmobile T9 cannon firing through the center of the propeller hub for optimum accuracy and stability when firing. This happened because H.M. Poyer, designer for project leader Robert Woods, was impressed by the power of this weapon and pressed for its incorporation. This was unusual, because fighter design had previously been driven by the intended engine, not the weapon system. Although devastating when it worked, the T9 had very limited ammunition, a low rate of fire, and was prone to jamming. A secondary benefit of the mid-engine arrangement was that it created a smooth and streamlined nose profile. Much was made of the fact that this resulted in a configuration “with as trim and clean a fuselage nose as the snout of a high velocity bullet”. Entry to the cockpit was through side doors (mounted on both sides of the cockpit) rather than a sliding canopy. Its unusual engine location and the long drive shaft caused some concern to pilots at first, but experience showed this was no more of a hazard in a crash landing than with an engine located forward of the cockpit. There were no problems with propeller shaft failure. Bell P-39 Airacobra center fuselage detail with maintenance panels open. The XP-39 made its maiden flight on 6 April 1938. at Wright Field, Ohio, achieving 390 mph (630 km/h) at 20,000 ft (6,100 m), reaching this altitude in only five minutes. However, the XP-39 was found to be short on performance at altitude. Flight testing had found its top speed at 20,000 feet to be lower than the 400 mph claimed in the original proposal. As originally specified by Kelsey and Saville, the XP-39 had a turbo-supercharger to augment its high-altitude performance. Bell cooled the turbo with a scoop on the left side of the fuselage. Kelsey wished to shepherd the XP-39 through its early engineering teething troubles, but he was ordered to England. The XP-39 project was handed over to others, and in June 1939 the prototype was ordered by General Henry H. Arnold to be evaluated in NACA wind tunnels to find ways of increasing its speed, by reducing parasitic drag. Tests were carried out, and Bell engineers followed the recommendations of NACA and the Army to reduce drag such that the top speed was increased 16%. NACA wrote, "it is imperative to enclose the supercharger within the airplane with an efficient duct system for cooling the rotor and discharging the cooling air and exhaust gases." In the very tightly planned XP-39, though, there was no internal space left over for the turbo. Using a drag-buildup scheme, a number of potential areas of drag reduction were found. NACA concluded that a top speed of 429 mph could be realized with the aerodynamic improvements they had developed and an uprated V-1710 with only a single-stage, single-speed supercharger. At a pivotal meeting with the USAAC and NACA in August 1939, Larry Bell proposed that the production P-39 aircraft be configured without the turbocharger. Some historians have questioned Bell’s true motivation in reconfiguring the aircraft. The strongest hypothesis is that Bell’s factory didn’t have an active production program and he was desperate for cash flow. Other historians mention that wind tunnel tests made the designers believe the turbocharger installation was so aerodynamically cluttered that it had more disadvantages than advantages. The Army ordered 12 YP-39s (with only a single-stage, single-speed supercharger) for service evaluation and one YP-39A. After these trials were complete, which resulted in detail changes including deletion of the external radiator, and on advice from NACA, the prototype was modified as the XP-39B; after demonstrating a performance improvement, the 13 YP-39s were completed to this standard, adding two 0.30 in (7.62 mm) machine guns to the two existing 0.50 in (12.7 mm) guns. Lacking armor or self-sealing fuel tanks, the prototype was one ton (900 kg) lighter than the production fighters. The production P-39 retained a single-stage, single-speed supercharger with a critical altitude (above which performance declined) of about 12,000 feet (3,660 m). As a result, the aircraft was simpler to produce and maintain. However, the deletion of the turbo destroyed any chance that the P-39 could serve as a medium-high altitude front-line fighter. When deficiencies were noticed in 1940 and 1941, the lack of a turbo made it nearly impossible to improve upon the Airacobra's performance. [N 4] The removal of the turbocharger and its drag inducing inlet cured the drag problem but reduced performance overall. In later years, Kelsey expressed regret at not being present to override the decision to eliminate the turbo. After completing service trials, and originally designated P-45, a first order for 80 aircraft was placed 10 August 1939; the designation reverted to P-39C before deliveries began. After assessing aerial combat conditions in Europe, it was evident that without armor or self-sealing tanks, the 20 production P-39Cs were not suitable for operational use. The remaining 60 machines in the order were built as P-39Ds with armor, self-sealing tanks and enhanced armament. These P-39Ds were the first Airacobras to enter into service with the Army Air Corps units and would be the first ones to see action. The P-39 was an all-metal, low-wing, single-engine fighter, with a tricycle undercarriage and an Allison V-1710 liquid-cooled V-12 engine mounted in the central fuselage, directly behind the cockpit. The Airacobra was one of the first production fighters to be conceived as a "weapons system"; in this case the aircraft (known originally as the Bell Model 4) was designed to provide a platform for the 37 mm T9 cannon. This weapon, which was designed in 1934 by the American Armament Corporation, a division of Oldsmobile, fired a 1.3 lb (610 g) projectile capable of piercing .8 in (2 cm) of armor at 500 yd (450 m) with armor-piercing rounds. The 90 in (230 cm)-long, 200 lb (91 kg) weapon had to be rigidly mounted and fire parallel to and close to the centerline of the new fighter. It would have been impossible to mount the weapon in the fuselage, firing through the cylinder banks of the Vee-configured engine and the propeller hub as could be done with smaller 20mm cannon. Weight, balance and visibility considerations meant that the cockpit could not be placed farther back in the fuselage, behind the engine and cannon. The solution adopted was to mount the cannon in the forward fuselage and the engine in the center fuselage, directly behind the pilot's seat. The tractor propeller was driven via a 10-foot-long (3.0 m) drive shaft made in two sections, incorporating a self-aligning bearing to accommodate fuselage deflection during violent maneuvers. This shaft ran through a tunnel in the cockpit floor and was connected to a gearbox in the nose of the fuselage which, in turn, drove the three- or (later) four-bladed propeller via a short central shaft. The gearbox was provided with its own lubrication system, separate from the engine; in later versions of the Airacobra the gearbox was provided with some armor protection. The glycol-cooled radiator was fitted in the wing center section, immediately beneath the engine; this was flanked on either side by a single drum-shaped oil cooler. Air for the radiator and oil coolers was drawn in through intakes in both wing-root leading edges and was directed via four ducts to the radiator faces. The air was then exhausted through three controllable hinged flaps near the trailing edge of the center section. Air for the carburetor was drawn in via a raised oval intake immediately aft of the rear canopy. The weapons bay of the P-39. Because the pilot was above the extension shaft, he was placed higher in the fuselage than in most contemporary fighters, which, in turn gave the pilot a good field of view. Access to the cockpit was via sideways opening "car doors", one on either side. Both had wind-down windows. As only the right-hand door had a handle both inside and outside this was used as the normal means of access and egress. The left-hand door could be opened only from the outside and was for emergency use, although both doors could be jettisoned. In operational use, as the roof was fixed, the cockpit design made escape difficult in an emergency. The complete armament fit consisted of the T9 cannon with a pair of Browning M2 .50 caliber (12.7 mm) machine guns mounted in the nose. This changed to two .50 in (12.7 mm) and two .30 in (7.62 mm) guns in the XP-39B (P-39C, Model 13, the first 20 delivered) and two 0.50 in/12.7 mm and four 0.30 in/7.62 mm (all four in the wings) in the P-39D (Model 15), which also introduced self-sealing tanks and shackles (and piping) for a 500 lb (227 kg) bomb or drop tank. Because of the unconventional layout, there was no space in the fuselage to place a fuel tank. Although drop tanks were implemented to extend its range, the standard fuel load was carried in the wings, with the result that the P-39 was limited to short-range tactical strikes. A heavy structure, and around 265 lb (120 kg) of armor were characteristic of this aircraft as well. The production P-39's heavier weight combined with the Allison engine with only a single-stage, single-speed supercharger, limited the high-altitude capabilities of the fighter. The P-39's altitude performance was markedly inferior to the contemporary European fighters and, as a result, the first USAAF fighter units in the European Theater were equipped with the Spitfire V. However, the P-39D's roll rate was 75°/s at 235 mph (378 km/h)– better than the A6M2, F4F, F6F, or P-38 up to 265 mph (426 km/h) (see NACA chart). Above the supercharger's critical altitude of about 12,000 ft (3,658 m), an early P-39's performance dropped off rapidly. This limited its usefulness in traditional fighter missions in Europe as well as in the Pacific, where it was not uncommon for Japanese bombers to attack at altitudes above the P-39's operational ceiling (which in the tropical hot air was lower than in moderate climates). The late production N and Q models, 75% of all Airacobras, could maintain a top speed of approximately 375 mph (604 km/h) up to 20,000 ft (6,100 m). The weight distribution of the P-39 was supposedly the reason for its tendency to enter a dangerous flat spin, a characteristic Soviet test pilots were able to demonstrate to the skeptical manufacturer who had been unable to reproduce the effect. After extensive tests, it was determined the spin could only be induced if the aircraft was improperly loaded, with no ammunition in the front compartment. The flight manual noted a need to ballast the front ammunition compartment with the appropriate weight of shell casings to achieve a reasonable center of gravity. High-speed controls were light, consequently high-speed turns and pull-outs were possible. The P-39 had to be held in a dive since it tended to level out, reminiscent of the Spitfire. The recommended never-exceed dive speed limit (Vne) was 475 mph (764 km/h) for the P-39. Soon after entering service, pilots began to report that “during flights of the P-39 in certain maneuvers, it tumbled end over end.” Most of these events happened after the aircraft was stalled in a nose high attitude with considerable power applied. Concerned, Bell initiated a test program. Bell pilots made 86 separate efforts to reproduce the reported tumbling characteristics. In no case were they able to tumble the aircraft. In his autobiography veteran test and airshow pilot R.A. “Bob” Hoover provides an account of tumbling a P-39. He goes on to say that in hindsight, he was actually performing a Lomcovak, a now-common airshow maneuver, which he was also able to do in a Curtiss P-40. [N 6] An informal study of the P-39’s spinning characteristics was conducted in the NASA Langley Research Center 20-foot Free-Spinning Tunnel during the 1970s. A study of old reports showed that during earlier spin testing in the facility, the aircraft had never tumbled. However, it was noted that all testing had been done with a simulated full ammunition load, which drew the aircraft’s center of gravity forward. After finding the original spin test model of the P-39 in storage, the new study first replicated the earlier testing, with consistent results. Then, the model was re-ballasted to simulate a condition of no ammunition load, which moved the aircraft’s center of gravity aft. Under these conditions, the model was found to often tumble when thrown into the tunnel. The rear-mounted engine was less likely to be hit when attacking ground targets, but was vulnerable to attacks from above and behind. At its upper altitude limits, the Airacobra was out-performed by many enemy aircraft. Bell P-39 Airacobra firing all weapons at night. In September 1940, Britain ordered 386 P-39Ds (Model 14), with a 20 mm (.79 in) Hispano-Suiza HS.404 and six .303 in (7.7 mm), instead of a 37 mm (1.46 in) cannon and six 0.30 in (7.62 mm) guns. The RAF eventually ordered a total of 675 P-39s. However, after the first Airacobras arrived at 601 Squadron RAF in September 1941, they were promptly recognized as having an inadequate rate of climb and performance at altitude for Western European conditions. Only 80 were adopted, all of them with 601 Squadron. Britain transferred about 200 P-39s to the Soviet Union. Another 200 examples intended for the RAF were taken up by the USAAF after the attack on Pearl Harbor as the P-400, and were sent to the Fifth Air Force in Australia, for service in the South West Pacific Theatre. By the time of the Pearl Harbor attack, nearly 600 P-39s had been built. When P-39 production ended in August 1944, Bell had built 9,558 Airacobras, of which 4,773 (mostly −39N and −39Q) were sent to the Soviet Union through the Lend-Lease program. There were numerous minor variations in engine, propeller, and armament, but no major structural changes in production types, excepting a few two-seat TP-39F and RP-39Q trainers. [N 7] In addition, seven went to the U.S. Navy as radio-controlled drones. A naval version with tailwheel landing gear, the XFL-1 Airabonita, was ordered as a competitor to the Vought F4U Corsair and Grumman XF5F Skyrocket. It first flew 13 May 1940, but after a troublesome and protracted development and testing period, it was rejected. The Airacobra saw combat throughout the world, particularly in the Southwest Pacific, Mediterranean and Soviet theaters. Because its engine was equipped with only a single-stage, single-speed supercharger, the P-39 performed poorly above 17,000 feet (5,200 m) altitude. In both western Europe and the Pacific, the Airacobra found itself outclassed as an interceptor and the type was gradually relegated to other duties. It often was used at lower altitudes for such missions as ground strafing. In 1940, the British Direct Purchase Commission in the U.S. was looking for combat aircraft; they ordered 675 of the export version Bell Model 14 as the "Caribou" on the strength of the company's representations on 13 April 1940. The British armament was two nose mounted 0.50 in (12.7 mm) machine guns, and four 0.303 in (7.7 mm) Browning machine guns in the wings; the 37 mm gun was replaced by a 20 mm (.79 in) Hispano-Suiza cannon. British expectations had been set by performance figures established by the unarmed and unarmored XP-39 prototype. The British production contract stated that a maximum speed of 394 mph (634 km/h) +/- 4% was required at rated altitude. In acceptance testing, actual production aircraft were found to be capable of only 371 mph at 14,090 ft. To enable the aircraft to make the guarantee speed, a variety of drag-reduction modifications were developed by Bell. The areas of the elevator and rudder were reduced by 14.2% and 25.2% respectively. Modified fillets were installed in the tail area. The canopy glass was faired to its frame with putty. The gun access doors on the wing had been seen to bulge in flight, so they were replaced with thicker aluminum sheet. Similarly, the landing gear doors deflected open by as much as two inches at maximum speed, so a stronger linkage was installed to hold them flush. The cooling air exit from the oil and coolant radiators was reduced in area to match the exit velocity to the local flow. New engine exhaust stacks, deflected to match the local flow and with nozzles to increase thrust augmentation, were installed. The machine gun ports were faired over, the antenna mast was removed, a single-piece engine cowling was installed and an exhaust stack fairing was added. Airacobra I AH589 L of 601 Squadron. The long-barrelled 20mm Hispano is clearly shown, as are the .303 wing guns. The airframe was painted with 20 coats of primer, with extensive sanding between coats. Standard camouflage was applied and sanded to remove the edges between the colors. Additionally, about 200 lb (91 kg) of weight was removed, making it lighter than normal (7,466 lb gross). After these modifications, the second production aircraft (serial AH 571) reached a speed of 391 mph (629 km/h) at 14,400 ft (4,400 m) in flight test. As this speed was within 1% of the guarantee, the aircraft was declared to have satisfied contractual obligations. Despite the success of these modifications, none were applied to other production P-39s. Later testing of a standard production P-400 by the British Aeroplane and Armament Experimental Establishment (A&AEE) revealed a top speed of only 359 mph (578 km/h). The British export models were renamed "Airacobra" in 1941. A further 150 were specified for delivery under Lend-lease in 1941 but these were not supplied. The Royal Air Force (RAF) took delivery in mid-1941 and found that performance of the non-turbo-supercharged production aircraft differed markedly from what they were expecting. In some areas, the Airacobra was inferior to existing aircraft such as the Hawker Hurricane and Supermarine Spitfire and its performance at altitude suffered drastically. Tests by the Royal Aircraft Establishment at Boscombe Down showed the Airacobra reached 355 mph (571 km/h) at 13,000 ft (3,962 m). The cockpit layout was criticized, and it was noted that the pilot would have difficulty in bailing out in an emergency because the cockpit roof could not be jettisoned. The lack of a clear vision panel on the windscreen assembly meant that in the event of heavy rain the pilot's forward view would be completely obliterated; the pilot's notes advised that in this case the door windows would have to be lowered and the speed reduced to 150 mph (241 km/h) On the other hand, it was considered effective for low level fighter and ground attack work. Problems with gun- and exhaust-flash suppression and the compass could be fixed. No. 601 Squadron RAF was the only British unit to use the Airacobra operationally, receiving their first two examples on 6 August 1941. On 9 October, four Airacobras attacked enemy barges near Dunkirk, in the type's only operational action with the RAF. The squadron continued to train with the Airacobra during the winter, but a combination of poor serviceability and deep distrust of this unfamiliar fighter resulted in the RAF rejecting the type after one combat mission. In March 1942, the unit re-equipped with Spitfires. The Airacobras already in the UK, along with the remainder of the first batch being built in the US, were sent to the Soviet Air force, the sole exception being AH574, which was passed to the Royal Navy and used for experimental work, including the first carrier landing by a tricycle undercarriage aircraft on 4 April 1945 on HMS Pretoria Castle, until it was scrapped on the recommendation of a visiting Bell test pilot in March 1946. The United States requisitioned 200 of the aircraft being manufactured for the UK, adopting them as P-400s (named for the advertised top speed of 400 mph (644 km/h)). After the attack on Pearl Harbor, the P-400 was deployed to training units, but some saw combat in the Southwest Pacific including with the Cactus Air Force in the Battle of Guadalcanal. Though outclassed by Japanese fighter aircraft, it performed well in strafing and bombing runs, often proving deadly in ground attacks on Japanese forces trying to retake Henderson Field. Guns salvaged from P-39s were sometimes fitted to Navy PT boats to increase firepower. Pacific pilots often complained about problems of performance and unreliable armament, but by the end of 1942, the P-39 units of the Fifth Air Force had claimed about 80 Japanese aircraft, with a similar number of P-39s lost. Fifth and Thirteenth Air Force P-39s did not score more aerial victories in the Solomons due to the aircraft's limited range and poor high altitude performance. Airacobras first fought Japanese Zeros on 30 April 1942 in a low level action near Lae, New Guinea. From May to August 1942 combat between Airacobras and Zeros took place on a regular basis over New Guinea. Compilation of combat reports indicates the Zero was either equal to or close to the P-39 in speed at the altitudes of the various low level encounters. From September to November 1942 pilots of the 57th Fighter Squadron flew P-39s and P-38s from an airfield built on land bulldozed into Kuluk Bay on the barren island of Adak in Alaska's Aleutian Islands. They attacked the Japanese forces that had invaded Attu and Kiska islands in the Aleutians in June 1942. The factor that claimed the most lives was not the Japanese but the weather. The low clouds, heavy mist and fog, driving rain, snow, and high winds made flying dangerous and lives miserable. The 57th remained in Alaska until November 1942, then returned to the United States. In North Africa, the 99th Fighter Squadron (also known as the Tuskegee Airmen) transitioned quickly from the P-40 and were assigned P-39s in February 1944, but only flew the type for a few weeks. The 99th carried out their duties including supporting Operation Shingle over Anzio as well as missions over the Gulf of Naples in the Airacobra but achieved few aerial victories. The major MTO P-39 operators included the 81st and 350th Fighter Groups, both flying the maritime patrol mission from North Africa and on through Italy. The 81st transferred to the China Burma India Theater by March 1944 and the 350th began transition to the P-47D in August 1944, remaining in Italy with the 12th Air Force. The most successful and numerous use of the P-39 was by the Red Air Force (Военно-воздушные силы, Voenno-Vozdushnye Sily, VVS). They received the considerably improved N and Q models via the Alaska-Siberia ferry route. The tactical environment of the Eastern Front did not demand the high-altitude performance the RAF and AAF did. The comparatively low-speed, low-altitude nature of most air combat on the Soviet Front suited the P-39's strengths: sturdy construction, reliable radio gear, and adequate firepower. Soviet pilots appreciated the cannon-armed P-39 primarily for its air-to-air capability. A common Western misconception is that the Bell fighters were used as ground attack aircraft. This is because the Soviet term for the mission of the P-39, prikrytiye sukhoputnykh voysk (coverage of ground forces) is commonly translated ground support, which is often taken to mean close air support. In Soviet usage, it has a broader meaning. Soviet-operated P-39s did make strafing attacks, but it was "never a primary mission or strong suit for this aircraft". The Soviets developed successful group aerial fighting tactics for the Bell fighters and scored a surprising number of aerial victories over a variety of German aircraft. Soviet P-39s had no trouble dispatching Junkers Ju 87 Stukas or German twin-engine bombers and matched, and in some areas surpassed, early and mid-war Messerschmitt Bf 109s. 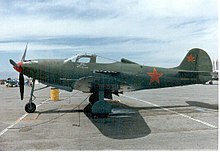 The usual nickname for the Airacobra in the VVS was Kobrushka ("little cobra") or Kobrastochka, a blend of Kobra and Lastochka (swallow), "dear little cobra". "I liked the Cobra, especially the Q-5 version. It was the lightest version of all Cobras and was the best fighter I ever flew. The cockpit was very comfortable, and visibility was outstanding. The instrument panel was very ergonomic, with the entire complement of instruments right up to an artificial horizon and radio compass. It even had a relief tube in the shape of a funnel. The armored glass was very strong, extremely thick. The armor on the back was also thick. The oxygen equipment was reliable, although the mask was quite small, only covering the nose and mouth. We wore that mask only at high altitude. The HF radio set was powerful, reliable and clear." The first Soviet Cobras had a 20 mm Hispano-Suiza cannon and two heavy Browning machine guns, synchronized and mounted in the nose. Later, Cobras arrived with the M4 37 mm cannon and four machine guns, two synchronized and two wing-mounted. "We immediately removed the wing machine guns, leaving one cannon and two machine guns," Golodnikov recalled later. That modification improved roll rate by reducing rotational inertia. Soviet airmen appreciated the M4 cannon with its powerful rounds and the reliable action but complained about the low rate of fire (three rounds per second) and inadequate ammunition storage (only 30 rounds). The Soviets used the Airacobra primarily for air-to-air combat against a variety of German aircraft, including Bf 109s, Focke-Wulf Fw 190s, Ju 87s, and Ju 88s. During the battle of Kuban River, VVS relied on P-39s much more than Spitfires and P-40s. Aleksandr Pokryshkin, from 16.Gv.IAP (16th Guards Fighter Aviation Regiment), claimed 20 victories in that campaign in a P-39. The last plane shot down by the Luftwaffe was a Soviet P-39, on May 8 by Oblt. Fritz Stehle of 2./JG 7 flying a Me 262 on Erzgebirge. Also, the last Soviet air victory was in a P-39 on May 9 when Kapitan Vasily Pshenichikov scored against a Focke-Wulf Fw 189, in the sky over Prague. Five of the 10 highest scoring Soviets aces logged the majority of their kills in P-39s. Grigoriy Rechkalov scored 44 victories in Airacobras. Pokryshkin scored 47 of his 59 victories in P-39s, making him the highest scoring P-39 fighter pilot of any nation, and the highest scoring Allied fighter pilot using an American fighter. This does not include his 6 shared victories, at least some of which were achieved with the P-39. The United States did not supply M80 armor-piercing rounds for the autocannons of Soviet P-39s—instead, the Soviets received 1,232,991 M54 high-explosive rounds, which they used primarily for air-to-air combat and against soft ground targets. The VVS did not use the P-39 for tank-busting duties. A total of 4,719 P-39s were sent to the Soviet Union, accounting for more than one-third of all U.S. and UK-supplied fighter aircraft in the VVS, and nearly half of all P-39 production. Soviet Airacobra losses totalled 1,030 aircraft (49 in 1942, 305 in 1943, 486 in 1944 and 190 in 1945). Airacobras served with the Soviet Air Forces as late as 1949, when two regiments were operating as part of the 16th Guards Fighter Aviation Division in the Belomorsky Military District. A total of 23 re-conditioned Airacobras, on loan from the U.S. Fifth Air Force (5 AF), were used by the Royal Australian Air Force (RAAF) as a stop-gap interceptor in rear areas. The aircraft were assigned the RAAF serial prefix A53. In the early months of the Pacific War, the RAAF was able to obtain only enough Curtiss Kittyhawks to equip three squadrons, destined for front-line duties in New Guinea. and – in the face of increasing Japanese air raids on towns in northern Australia – was forced to rely on the P-40, P-39, and P-400 units of 5 AF for the defence of areas such as Darwin. During mid-1942, USAAF P-39 units in Australia and New Guinea began to receive brand new P-39Ds. 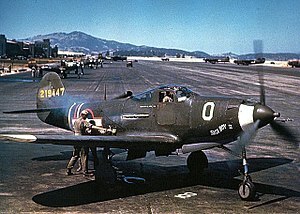 Consequently, P-39s that had been repaired in Australian workshops were loaned by 5 AF to the RAAF. In July, seven P-39Fs arrived at 24 Squadron, in RAAF Bankstown in Sydney. In August, seven P-39Ds were received by No. 23 Squadron RAAF at Lowood Airfield, near Brisbane. Both squadrons also operated other types, such as the CAC Wirraway armed trainer. Neither squadron received a full complement of Airacobras or saw combat with them. From early 1943, the air defence role was filled by a wing of Spitfires. Both 23 and 24 Squadron converted to the Vultee Vengeance dive bomber in mid-1943, their P-39s transferred to two newly formed fighter squadrons: No. 82 (augmenting P-40s, still in short supply) at Bankstown and No. 83 (as it awaited the Australian-designed CAC Boomerang) in Strathpine, near Brisbane. After serving with these squadrons for a few months, the remaining Airacobras were returned to the USAAF and the RAAF ceased to operate the type. In 1940, France ordered P-39s from Bell, but because of the armistice with Germany they were not delivered. After Operation Torch, French forces in North Africa sided with the Allies, and were re-equipped with Allied equipment including P-39Ns. From mid-1943 on, three fighter squadrons, the GC 3/6 Roussillon, GC 1/4 Navarre and GC 1/5 Champagne, flew these P-39s in combat over the Mediterranean, Italy and Southern France. A batch of P-39Qs was delivered later, but Airacobras, which were never popular with French pilots, had been replaced by P-47s in front line units by late 1944. A Bell P-39N-1 Airacobra (USAAF serial 42-9377) which was supplied by the U.S. Army Air Force to the Italian Regia Aeronautica’s (Italian Co-Belligerent Air Force) 4th Stormo in the summer of 1944. In June 1944, the Italian Co-Belligerent Air Force (ICAF) received 170 P-39s, most of them -Qs, and a few -Ns (15th USAAF surplus aircraft stored in Napoli-Capodichino airfield) and also at least one -L and five -Ms. The P-39 N (without the underwing fairing for 12.7 machine guns) had engines with about 200 hours; a little newer than the P-39Q engines with 30–150 hours. A total of 149 P-39s would be used: the P-39N for training, while newer Qs were used in the front line. In June–July 1944, Gruppi 12°, 9° and 10° of 4° Stormo, moved to Campo Vesuvio airstrip to re-equip with the P-39s. The site was not suitable and, in three months of training, 11 accidents occurred, due to engine failures and poor maintenance of the base. Three pilots died and two were seriously injured. One of the victims, on 25 August 1944, was the "ace of aces", Sergente Maggiore Teresio Vittorio Martinoli. The three groups of 4° Stormo were first sent to Leverano (Lecce) airstrip, then in mid-October, to Galatina airfield. At the end of the training, eight more accidents occurred. Almost 70 aircraft were operational, and on 18 September 1944, 12° Group's P-39s flew their first mission over Albania. Concentrating on ground attack, the Italian P-39s proved to be suitable in this role, losing 10 aircraft between 4 November and 3 December 1944, to German flak. In February–March 1945, 10° and 9° Gruppi moved North of Galatina, in Canne airbase, near Campobasso, while Allied allowed Italian pilots to use the airstrip of Lissa island, in the Adriatic sea, as an intermediate scale during the long sorties on the Balkans. The 4° Stormo pilots flew many effective ground attack missions on northern Yugoslavia, losing only one more P-39, for engine failure in Sarajevo area, on 2 April 1945. The Italian P-39 flew over 3,000 hours of combat. By the end of the war, 89 P-39s were still at the Canne airport and 13 at the Scuola Addestramento Bombardamento e Caccia ("Training School for Bombers and Fighters") at Frosinone airfield. In 10 months of operational service, the 4° Stormo had been awarded three Medaglia d'Oro al Valore Militare "alla memoria". After the war the P-39s were taken over by the Aeronautica Militare Italiana (the new Italian air force) and used for several years as training aircraft. In Galatina fighter training unit (Scuola Caccia), war veteran Tenente colonnello Francis Leoncini was killed during a flying accident, on 10 May 1950. Between December 1942 and February 1943, the Aeronáutica Militar (Army Military Aviation) obtained aircraft operated by the 81st and the 350th Fighter Groups originally dispatched to North Africa as part of Operation Torch. Due to several problems en route, some of the aircraft were forced to land in Portugal and Spain. Of the 19 fighter aircraft that landed in Portugal, all were interned and entered service that year with the Portuguese Army Military Aviation. They formed the Squadron OK, based at Ota Air Base. Though unnecessary, the Portuguese Government paid the United States US$20,000 for each of these interned aircraft as well as for one interned Lockheed P-38 Lightning. The U.S. accepted the payment, and gave as a gift four additional crates of aircraft, two of which were not badly damaged, without supplying spares, flight manuals or service manuals. Without proper training, incorporation of the aircraft into service was plagued with problems, and the last six Portuguese Airacobras that remained in 1950 were sold for scrap. A very small number of late-production P-39Qs survived long enough in the USAAF inventory to be acquired by the United States Air Force upon its separation from the Army. These aircraft served in training and testing roles for approximately a year. They were redesignated as ZF-39Qs ("ZF" for "Obsolete Fighter") in June 1948 as part of the new aircraft designation scheme throughout the USAF. In 1945, Italy purchased the 46 surviving P-39s at 1% of their cost but in summer 1946 many accidents occurred, including fatal ones. By 1947, 4° Stormo re-equipped with P-38s, with P-39s sent to training units until the type's retirement in 1951. Only a T9 cannon survives today at Vigna di Valle Museum. Mira Slovak's P-39Q "Mr. Mennen"
The Airacobra was raced at the National Air Races in the United States after World War II. Famous versions used for racing included the twin aircraft known as "Cobra I" and "Cobra II," owned jointly between three Bell Aircraft test pilots, Chalmers "Slick" Goodlin, Alvin M. "Tex" Johnston, and Jack Woolams. These aircraft were extensively modified to use the more powerful P-63 engine and had prototype propeller blades from the Bell factory. "Cobra I" with its pilot, Jack Woolams, was lost in 1946 during a test flight over Lake Ontario, late in the afternoon, possibly at speeds of up to 400 mph. The aircraft suddenly and inexplicably crashed into the water, breaking apart upon impact. The "Cobra II" (Race #84) flown by test pilot "Tex" Johnston, beat racing-modified P-51s, as well as other P-39 racers (which were the favorites), to win the 1946 Thompson Trophy race. Cobra II competed again in the 1947 Thompson Trophy, finishing 3rd. In the 1948 Thompson trophy, she was unable to finish due to engine difficulties. Cobra II did not race again and was destroyed on 10 August 1968 during a test flight prior to an attempt at the world piston-engine air speed record, when owner-pilot Mike Carroll lost control and crashed. Carroll died and the highly modified P-39 was destroyed. Mira Slovak's P-39Q "Mr. Mennen" (Race #21, former USAAC serial no. 44-3908, civil registry NX40A) was a very fast unlimited racer; a late arrival in 1972 kept the 2,000 hp (1,491 kW) racer out of the Reno races, and she was never entered again. Her color scheme was all white with "Mennen" green and bronze trim. She is now owned and displayed by the Kalamazoo Air Zoo, in the color scheme of P-400 "Whistlin' Britches." Bell Model 11, one prototype 38–326 first flown 6 April 1938. Powered by an Allison V-1710-17 (E2) engine (1,150 hp/858 kW), the aircraft was fitted with a General Electric B-5 turbosupercharger, creating a two stage supercharging system similar to the P-38. Provision was made for two .50 in (12.7 mm) machine guns in the forward fuselage and one 25 mm (.98 in) cannon but aircraft remained unarmed. Later converted to XP-39B. One conversion first flown 25 November 1939. Streamlined XP-39 based on NACA wind tunnel testing resulting in revised canopy and wheel door shape, oil and radiator intakes moved from right fuselage to wing roots, fuselage increased length (by 1 ft 1 in, to 29 ft 9 in) and decreased wingspan (by 1 ft 10 in, to 34 ft). The turbosupercharger was removed, and the single-stage, single speed, supercharged Allison V-1710-37 (E5) engine (1,090 hp/813 kW) was left in place. The carburetor air intake was moved behind canopy, just above the carburetor. Bell Model 13, production variant based on the P-39C with 245 lb (111 kg) of additional armor, self-sealing fuel tanks. Armament increased to 1 × 37 mm/1.46 in cannon (30 rounds), 2 × .50 in/12.7 mm (200 rpg) and 4 × wing mounted .30 in/7.62 mm (1,000 rpg) machine guns; 60 Produced. Bell Model 14A, production variant fitted with a 20 mm (.79 in) M1 cannon. Specifically ordered for delivery under Lend-Lease; 336 produced:1 sent to Soviet Union and used in combat alongside P-39D-2s. Bell Model 14A-1, production variant with a V-1710-63 (E6) engine (1,325 hp/988 kW) restored the 37 mm (1.46 in) cannon, provisions for a single 145 gal (549 l) drop tank or maximum 500 lb (227 kg) bomb under the fuselage; 158 produced. Some 50 at least sent to USSR and used in combat, some 15-20 used by 16th Guards Fighter Regiment. Bell Model 23. three P-39Ds modified for ground and flight testing first flown 21 February 1942. Intended for Continental I-1430-1 engine with (2,100 hp/1,566 kW) actually flown with Allison V-1710-47 (1,325 hp/988 kW) engine. Airframes were used to test various wing and different vertical tail surfaces. Fuselage was lengthened by 1 ft 9 in (53 cm). Used in the development of the P-63. The production variant, with the Continental engines was to be redesignated P-76; there was no Bell XP-76 as such. Bell Model 26, 1800 ordered, intended to be a P-39D-2 with an Aeroproducts propeller. Due to modifications during production no P-39G were actually delivered. Instead, these aircraft were re-designated P-39K, L, M and N.
Bell Model 15B, P-39F with V-1710-59 (1,100 hp/820 kW) engine with automatic boost control,; 25 built. Bell Model 26A, a P-39D-2 with Aeroproducts propeller and V-1710-63 (E6) (1,325 hp/988 kW) engine. Vents added to nose; 210 built. Some 50 sent to USSR and used in combat - 16th Guards Fighter Regiment were initially issued 11, 1 of, which was Pokryshkin's first Airacobra mount. Bell Model 26D, variant with an 11 ft 1 in Aeroproducts propeller, V-1710-67 (E8) (1,200 hp/895 kW) engine with improved high-altitude performance at the expense of low-altitude performance, 10 mph (16 km/h) faster than P-39L at 15,000 ft (4,600 m). Note: some P-39M-1BE were delivered with the V-1710-83 (E18) engine; 240 built. Bell Model 26N, originally part of the P-39G order. V-1710-85 (E19) (1,325 hp/988 kW) engine. Aeroproducts propeller (10 ft 4 in diameter) & different propeller reduction gear ratio. Starting with the 167th aircraft, propeller increased to 11 ft 7 in & internal fuel reduced from 120 gal (454 l) to 87 gal (329 l); 500 built. One conversion to a two-seat training variant with additional cockpit added in nose – no armament. Enlarged tail fillet and a shallow ventral fin added. Production variant with minor equipment changes. The under-wing 0.50 in (12.7 mm) machine gun pods were sometimes omitted in this version; 1,000 built. Production variant that reverted to the three-bladed propellor; 400 built. Remaining examples in service, re-designated in June 1948. One prototype tail-wheel undercarriage carrier fighter for the USN. United States Navy (USN) designation for two P-39Qs used as target drones. Assigned to NAS Cape May for test work. Later redesignated F2L-1K. An export model of the P-39 with a less powerful cannon, using a 20 mm cannon rather than the common 37 mm cannon. It also had 2 .50 caliber machine guns in the nose, and 2 .30 caliber machine guns in each wing. Bell Model 13, Royal Air Force (RAF) designation for three P-39Cs delivered to the A&AEE Boscombe Down for testing. 41-6951 - Beck Military Collection in Mareeba, Queensland. 44-2664 - Aviation Museum of Central Finland in Tikkakoski. 41-7215 - restored by Pioneer Aero Ltd at Ardmore, Auckland, for Jerry Yagen's Military Aviation Museum. S/N 15-554, based on the wrecks of two aircraft recovered from Russia and restoration started at Wangaratta, Australia.. First flight at Ardmore by Frank Parker on 26 February 2019. Painted in USAAF colours as 42-20341. 42-19039 - J. K. McCarthy Museum in Goroka, Papua New Guinea. 42-8740 (unnamed) - Yanks Air Museum in Chino, California. 42-19597 Miss Connie - Commemorative Air Force (CenTex Wing) in San Marcos, Texas. 42-19993 Brooklyn Bum - Lewis Air Legends in San Antonio, Texas. 42-18814 Girlie - recovered from Tadji New Guinea in 1972 by MARC Pima Air & Space Museum, adjacent to Davis-Monthan AFB in Tucson, Arizona. 42-18408 Snooks 2nd / Betty Lou 3rd - Buffalo and Erie County Naval & Military Park in Buffalo, New York. 42-19027 Small Fry/Little Sir Echo - Planes of Fame in Chino, California. 42-20000 (unnamed) - March Field Air Museum at March ARB (former March AFB) in Riverside, California. 42-20007 (unnamed) - Virginia Air & Space Center near Langley AFB in Hampton, Virginia. 44-2485 (unnamed) - Erickson Aircraft Collection in Madras, Oregon. 44-3887 (unnamed) - National Museum of the United States Air Force at Wright-Patterson AFB in Dayton, Ohio. 44-2433 Galloping Gertie - in storage at the Paul Garber Facility of the National Air and Space Museum in Silver Hill, Maryland. 44-2911 Miss Lend Lease - under restoration at the Niagara Aerospace Museum in Niagara Falls, New York. This plane was recovered from a Russian lake after disappearing during a routine mission during WWII. The pilot's remains were recovered and buried with full military honors. The aircraft crashed due to engine failure, as two holes were found inside the engine block from snapped connecting rods. Bell P-39Q Airacobra at the National Museum of the United States Air Force. P-39Q at the National Museum of the U.S. Air Force. This winter diorama shows ground crew with a Type F-1A Utility Heater in front of an Airacobra flown by Lt. L. Spoonts of the 57th FS based on Adak Island during the Aleutians Campaign in 1942. The P-39 Airacobra is featured in the Russian movie Peregon (Transit) (2006) dealing with Lend Lease aircraft in transit to the Soviet Union. ^ Some sources give 6 April 1939 as the date of the first flight; there is very good evidence that 1938 is correct (see talk page). ^ The P-39 has the highest total number of individual victories attributed to any U.S. fighter type, not kill ratio; Finnish-modified Brewster Buffalos had the highest kill ratio. ^ Brigadier General Benjamin S. Kelsey recalled in 1977 he and Lieutenant Gordon P. Saville (later General) drew up the specification in 1937 using the word "interceptor" as a way to bypass the inflexible Army Air Corps requirement for pursuit aircraft to carry no more than 500 lb (230 kg) of armament including ammunition. Kelsey was looking for a minimum of 1,000 lb (450 kg) of armament. ^ Quote: "With the turbo, Bell's fighter had outstanding performance in spite of the associated drag penalties NACA aerodynamicists found so objectionable. Elimination of the turbo without substituting comparable gear-driven supercharger performance relegated the airplane to an 'also-ran'...""... there is no doubt that the deletion of the turbo-supercharger ruined the P-39." ^ Note: Photographs of the P-39's structure can be found in images from: "Image of P-39 structure. ", "P-39 recovered fuselage structure. ", "P-39 Cockpit and rear arch." pacificwrecks.com. Retrieved: 12 May 2009. ^ The Lomcovak was introduced to competition aerobatics by the Czechoslovak national team, flying the Zlin 526, in the 1960s. In any of several variations, the Lomcovak involves autorotating the aircraft end over end at the apex of a climbing outside snap roll. Most Lomcovaks are entered from a near vertical attitude with power applied, which matches the description of how P-39 tumbles were entered. ^ Trainers were a rarity for fighter types outside the Soviet Union in the 1940s. ^ a b Angelucci and Bowers 1987, p. 41. ^ a b Matthews 1996, p. 85. ^ Angelucci, Enzo (1988). Combat aircraft of World War II. p. 40. ISBN 0-517-64179-8. ^ "Army Air Forces Statistical Digest – World War II." usaaf.net Retrieved: 26 September 2011. ^ a b Gunston 1980, p. 22. ^ a b Angelucci and Matricardi 1978, p. 25. ^ Lockheed P-38 Lightning. Retrieved: 21 January 2007. ^ a b Donald 1997, p. 106. ^ McDowell 1980, p. 10. ^ Johnsen 1998, p. 7. ^ Johnsen 1998, p. 8. ^ a b Pearcy 1993, p. 25. ^ a b c AAHS Journal 2001, pp. 295–297. ^ Matthews 1996, p. 97. ^ Matthews 1996, p. 101. ^ Matthews 1996, p. 102. ^ Lednicer 2000, p. 2. ^ a b Fitzsimons 1977, p. 50. ^ Kinzey 1999, pp. 9, 13. ^ Dean 1997, p. 191. ^ Dwyer, Larry. "Allison V-1710 – USA." Aviation-History.com, 6 August 2005. Retrieved: 25 March 2009. ^ a b c d Bowers 1978, p. 24. ^ a b Green and Swanborough 1977, pp. 8–9. ^ "P-39 cooling system (PDF File)." zenoswarbirdvideos.com. Retrieved: 12 May 2009. ^ Johnson and Heffernan 1982, p. 90. ^ Dean 1997, pp. 191–192. ^ Dean 1997, pp. 192, 602. ^ Dean 1997, p. 200. ^ Hoover and Shaw 1996, pp. 25–26. ^ Lednicer 2000, p. 7. ^ Dean 1997, pp. 206–207. ^ Dean 1997, p. 194. ^ Donald 1997, p. 107. ^ a b Matthews 1996, p. 120. ^ Matthews 1996, pp. 119–120. ^ "The Calamitous ‘Cobra'." Air Enthusiast, Vol. 1, No. 3, August 1971. ^ Mason 1969, pp. 5–6. ^ Johnson and Heffernan 1982, p. 93. ^ Johnson and Heffernan 1982, pp. 91–92. ^ Brown 2006, p. 93. ^ Brown 2006, p. 145. ^ Baugher, Joe. "Airacobra I for RAF, P-400." Bell P-39 Airacobra, 4 August 2010. Retrieved: 16 September 2010. ^ Pejčoch 2008, p. 86. ^ "The combat record of the Tuskegee Airmen speaks for itself." Archived November 30, 2010, at the Wayback Machine tuskegeeairmen.org. Retrieved: 16 October 2009. ^ Colonel Dmitriy Loza, Red Army. Loza and Gebhardt 2002, pp. 15–16. ^ Mitchell 1992, p. 34. ^ a b c Drabkin 2007, p. 133. ^ Gebhardt, Major James F., USAF (Retired). "Some Additional P-39 History." Archived December 14, 2009, at the Wayback Machine March Field Air Museum. Retrieved: 29 October 2009. ^ Morgan 1999, p. 20. ^ Bergstrom, Christer (2008). Bagration to Berlin: The Final Air Battles in the East: 1944–1945. Great Britain: Ian Allan. pp. 123–124. ISBN 978-1-903223-91-8. ^ Bergstrom, Christer (2008). Bagration to Berlin: The Final Air Battles in the East: 1944–1945. Great Britain: Ian Allan. p. 124. ISBN 978-1-903223-91-8. ^ Saltzman, B. Chance; Searle, Thomas R. (2001). Introduction to the United States Air Force. Airpower Research Institute, Air University Press. p. 114. ISBN 978-1-4289-2621-9. ^ Loza and Gebhardt 2002, p. 359. ^ Hardesty 1991, p. 253. ^ Bergström 2008, p. 132. ^ Holm, Michael. "P=39." Archived April 1, 2012, at the Wayback Machine ww2.dk. Retrieved: 26 September 2011. ^ a b c d e Crick, Darren. "RAAF A53 Bell P-39D/F Airacobra" adf-serials.com, 2006. Retrieved: 28 August 2013. ^ a b c d Birkett, Gordon R. "RAAF Bell Airacobras Part 1." adf-serials.com, 2005. Retrieved: 20 June 2007. ^ "Dimensione Cielo aerei Italiani nella Seconda Guerra Mondiale." Caccia Assalto3. Roma: Edizioni Bizzarri, 1972, pp. 75–76. ^ Dimensione Cielo 1972, p. 77. ^ a b Dimensione Cielo 1972, p. 78. ^ "Dimensione Cielo aerei Italiani nella Seconda Guerra Mondiale." Caccia Assalto3. Roma: Edizioni Bizzarri, 1972, p. 78. ^ "The P-400 / P-39L Airacobra." Portuguese Airacobra service history. Retrieved: 16 October 2009. ^ a b Public Record Office entry of 18 March 1943, quoted by "Wreckovery" in Aviation News, 10–23 August 1984. ^ a b Bowers 1979, p. 25. ^ "ALLISON V-1710-85 & DRIVE TRAIN FOR P-39Q". National Museum of the US Air Force. Archived from the original on March 3, 2015. Retrieved 21 April 2016. ^ "P-39D Airacobra/41-6951" pacificwrecks.com Retrieved: 4 March 2015. ^ "P-39Q Airacobra/44-2664" aerialvisuals.ca Retrieved: 4 March 2015. ^ "P-39F Airacobra/41-7215". pacificwrecks.com Retrieved: 14 December 2010. ^ "News: P-39 flies in New Zealand". Aeroplane. Vol. 47 no. 4. April 2019. pp. 6–7. ISSN 0143-7240. ^ "P-39N Airacobra/42-19039" pacificwrecks.com Retrieved: 4 March 2015. ^ "FAA Registry: N81575" FAA.gov Retrieved: 10 July 2014. ^ "P-39N Airacobra/42-8740" Yanks Air Museum Retrieved: 3 May 2017. ^ "P-39Q Airacobra/42-19597" CAF CenTex Wing Retrieved: 3 May 2017. ^ "FAA Registry: N6968" FAA.gov Retrieved: 28 April 2011. ^ "P-39Q Airacobra/42-19993" Lewis Air Legends Retrieved: 1 October 2013. ^ "FAA Registry: N139RL" FAA.gov Retrieved: 28 April 2011. ^ "P-39N Airacobra/42-18814" Pima Air and Space Museum Retrieved: 03 September 2013. ^ "P-39N Airacobra/42-18408" Buffalo and Erie County Naval & Military Park Retrieved: 10 April 2012. ^ "P-39N Airacobra/42-19027" Planes of Fame Museum Retrieved: 14 December 2010. ^ "P-39Q Airacobra/42-20000" March Field Air Museum Retrieved: 19 December 2017. ^ "P-39Q Airacobra/42-20007" Virginia Air & Space Center Retrieved: 19 December 2017. ^ "P-39Q Airacobra/44-2485" Erickson Aircraft Collection Retrieved: 8 March 2015. ^ "RP-39Q Airacobra/44-3887" National Museum of the USAF Retrieved: 19 December 2017. ^ "RP-39Q Airacobra/44-3908" Kalamazoo Aviation History Museum Retrieved: 1 October 2013. ^ "P-39Q Airacobra/44-2433" National Air and Space Museum Retrieved: 22 July 2014. ^ "P-39Q Airacobra/44-2911" Niagara Aerospace Museum Retrieved: 4 March 2015. ^ "Peregon" (2006) IMDb. Retrieved: 16 September 2010. Roman, Valerij. Aerokobry vstupayut v boy ('Airacobras enter combat'), Белл P-400, P-39D-1, P-39D-2 ("Avia-retro" series 1) (in Ukrainian). Kiev, Ukraine: Aero-Hobby, 1993. ISBN 5-77075-170-3. Wikimedia Commons has media related to P-39 Airacobra. Australian War Memorial, US 5th Airforce gun camera footage, 1943. Includes rare P-39 gun camera footage (from the 1:03 mark). Lt Robert Adler (41st FS, USAAF) downing two twin-engine Japanese bombers near Tsili Tsili, New Guinea, on August 15, 1943. This page was last edited on 8 April 2019, at 17:58 (UTC).